Join the thousands of people that have learned about Chilean culture with this ultimate Gringo’s Culture Guide to Chile. If you want to enjoy your trip to Chile and not look like a confused tourist – you’re not alone. Who is this Gringo’s Culture Guide to Chile for? 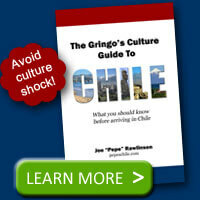 What is the Gringo’s Culture Guide to Chile? 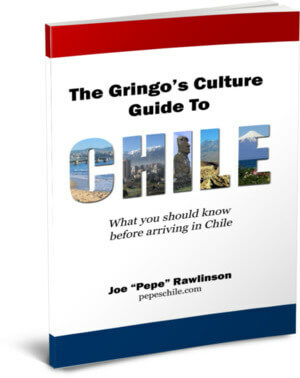 The Gringo’s Culture Guide to Chile is designed to help you survive the shock of Chilean culture so you can relax, soak in the experience, and know exactly what you’re about to see, hear, eat, and live. All-in-all, this guide will transform you from a blissfully unaware gringo to an almost full-fledged Chilean from the moment you arrive in Chile. Joe Rawlinson lived in Chile for two years and fell in love with the Chilean people and this beautiful country. Since 1998, he has helped thousands of people like you learn more about this wonderful country via his Pepe’s Chile website. This book is NOT a tour guidebook. If that is what you’re looking for, check out one of these guidebooks. P.S. If you want to make the most of your Chile trip, better understand the Chilean culture, and avoid unnecessary surprises and headaches, then buy your Chile culture guide right now. Everyone who plans to visit or live in Chile MUST read this book! It gives a thorough overview of what to expect. It is set in an easy-to-read format and served as a good reference guide when I visited Chile. The book is very informative. Thanks for the direct and simple approach you use in the book. – Dave H. (California, USA). I lived in Chile for ten years myself, and find this to be an excellent resource. I think the book is very well done. It could be said that you are more Chilean than many of those born in Chile. You are truly an encyclopedia of the country. Your explanations are very detailed, are easily understood, and we can show people from other countries and they understand quickly. You have a very entertaining way of recounting things. Very well organized and entertaining. Congratulations. I really enjoyed reading your work on Chilean slang, it was amazing.